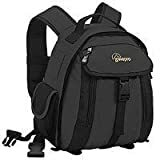 This backpack has a large front pocket with organizer, expandable side pockets, laminated mesh pockets, shoulder straps, sternum strap, a removable waist belt and attachment loops for SlipLock add-ons. Removable bottom straps take a small tripod or a windbreaker. I bought this to replace a Tamrac Velocity sling bag I had, which I was not happy with for a variety of reasons. (note: This Velocity model was replaced by a new design, and although I have not tried it, it appears that have made several improvement to it). This photography backpack is a nice compromise between huge, "bring everything" models, and small, "take only the basics" bags. *	In addition to these items, there is plenty of room and pockets to carry all of your small items such as batteries, cell phone, filters, walkie-talkie, etc. *	The bag is well padded on all sides. *	I use this in the Arizona desert where triple digits temperatures are the norm a good part of the year. The part of the bag that rest against your back has ventilated padding and this really helps. The back of my shirt is not soaked in sweat when I take this off. *	It is very well designed. For the most part the pocket locations are just what I'd want and there are a variety of different sizes of pockets. Many have velcro or zipper closures. There a lot of place to put stuff both inside and out. I can't say the same for other bags I've looked at. *	It has adjustable chest and waist straps. This not only makes the bag more comfortable when fully loaded but it's a must if you are hiking on rugged terrain. *	The tripod straps are removable. *	It's a comfortable bag. *	The workmanship seems top-notch. I've only had mine for about a year but it has held up very well. *	Because of all the padding, this bag is very stiff. When empty it is going to take up as much space as when full. It's not a bag you can collapse easily and place in a suitcase for travel. *	You have to fully remove it to take your camera out. This is not a bag you want if you need to whip your camera out in a hurry. This is true of most backpack style bags - although manufacturers are starting to come up with clever ways around this. (see Lowepro Fastpacks). *	Although this bag should protect your gear from a light rain, it's not an all-weather pack. *	Thera is no large separate compartment for non-camera gear (lunch, jacket etc.) There is an outside pocket on the back which expands and can hold some items, but not a lot. I've been able to stuff a non-insulated windbreaker in it, but anything heavier will not fit. In the bag's defense, it would be impossible to do this without : 1) making the bag bigger, or 2) make the camera storage area smaller. As such, this not really a "con," but it is something to consider. Overall this is a great mid-size bag for photographers. It works great on hikes into the back woods, or a day's excursion at Disneyland. Got it to hold my small travel outfit, D50 with 3 lens and SB-800. Already have a full sized backpack, so the 200 is a perfect compliment. This backpack is amazing. I bought it because I knew I would need something. This bag is better than I ever expected. Currently in my bag: SB-400 Flash, 3x Filters, 55-200mm VR lens, 18-55 VR lens, camera body, lens hood, 2x battery chargers, 8x AA batteries, 3x EN-EL9 Batteries, lens bag, PnS camera, 8x SD Cards in cases (5x 8GB cards, 2x 4GB Cards, 1x 2GB Card)... I still have room for more items! I just wish it had a security strap.